In this article Nidal demonstrates how to create a DataGrid filter using TextBox and ComboBox. There are multiple cases where you are asked to provide a filter on your DataGrid. For example, you need a filter when using a typed text or even when allowing the user to select from a specified list. In this article I will explain one way of providing the end user with a professional look and performance even if you are dealing with millions of records. 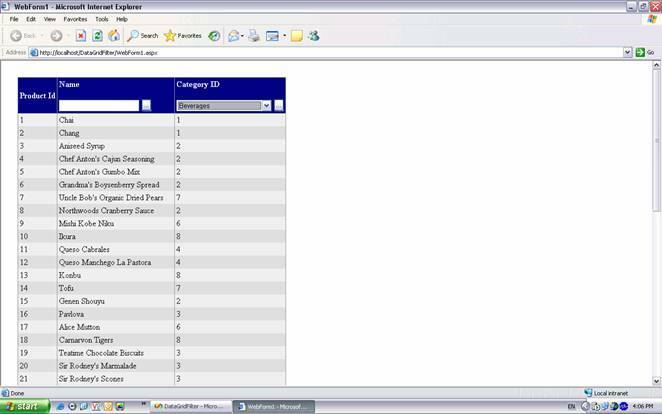 For demonstration purposes I will be using the NorthWind database available from Microsoft for download. Take a look a Figure 1 to get a feeling for what we are going to have in the end. To arrive at this point I shall explain in detail every step.